I wish my camera could capture the depth and iridescence of these gold-glazed pink beads. The effect is a subtle peachiness that varies with the lighting. I normally find a straight line of beads monotonous but these beads need nothing else. 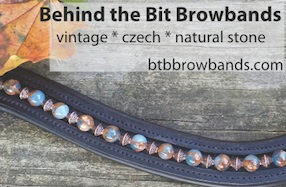 Go to btbbrowbands.com to see more photos and options. Hi Kaede, Harv is good. In April when his urinary incontinence started I hoped we would make it through the summer. He had a super summer and heading into fall there are few signs of decline -- maybe a litle wobblier, but fat and happy and eating great. His legs require daily cleaning and I go through a jar of Furazone a week -- but he is a joy. Just FYI, I have not done so many "horsie" updates recently partly b/c there is not much in the way of an update with the horses, and I figured you'd be bored with same old same old. 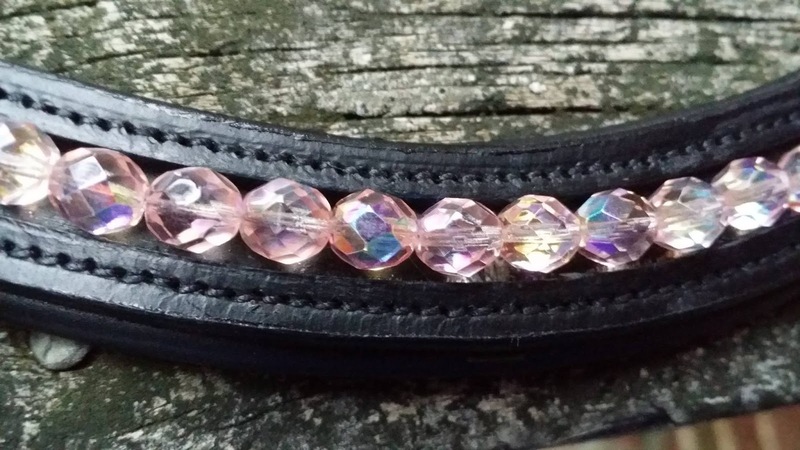 I don't mean to push the beading, but I am excited about making browbands I like! The browband posts are handy also because I was visiting my parents in KY last week and part of this week. Neither of them is in the best health. I'll try to get some footage of Riley soon. Thanks guys!